Late last month, I sold my beloved Grado RS1e headphones, which get my highest recommendation. Parting ways, time is long overdue for a review, even if post-mortem. I let go the cans mainly because my lifestyle changed. Being tethered by wires is too confining; I listen to music more on the move now. As such, fine-fidelity Bluetooth cans—Master & Dynamic MW60—give great sound with more flexibility and mobility. I purchased the RS1e direct from manufacturer Grado Labs in late July 2014, soon after release. Grado is a family-owned/run Brooklyn, New York-based business that opened in 1953 offering turntable cartridges. In 1990, the company started selling headphones, which are hand-crafted and tested for the distinctive, sound signature that defines them. Founder Joseph Grado passed away in February 2015 at age 90. The "e" series are my second Grados. I previously owned the RS1i, which launched in 2008. I bought a pair in late July 2010. My birthday is that month, if you wonder why the seemingly coincidental timing. Perhaps it's appropriate then that the buyer, who lives in Palm Springs, Calif., bought my RS1e for his 46th birthday. Grados came to my attention from watching blind character Auggie Anderson use RS2i on TV show Covert Affairs. Hehe, I met the actor playing him, Christopher Gorham, while buying coffee during San Diego Comic-Con 2016. He is immediately likable and gracious, BTW. Grados look like no other headphones most buyers will ever see. The earpiece enclosures are made of wood—mahogony for the RS series. Hehe, retro is a popular style in decade 2010, and Grados look the part, with grain set against leather headband wrapped around flat-metal strap. 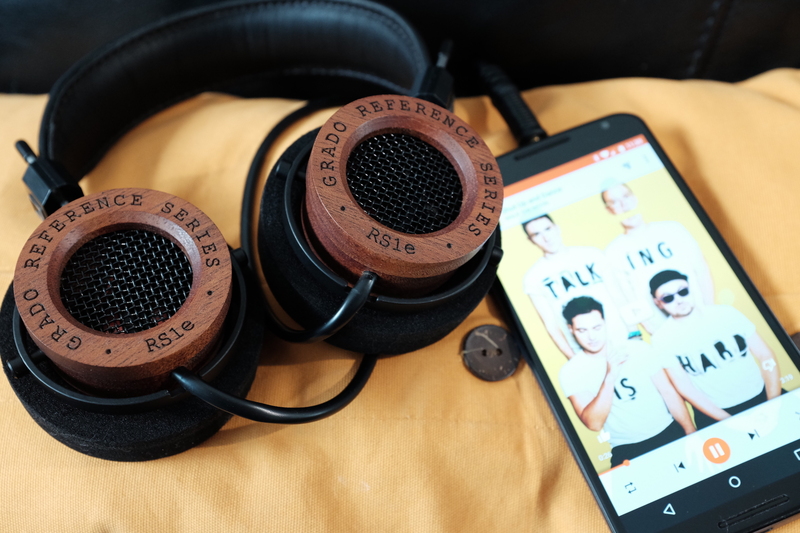 Mahogany is far more important than appearance—for its importance to resonance and producing the airy, but distinctive defining Grado sound signature. The wood is as much metaphor as it is functional. The material is more than just natural, providing the timbre for producing more natural sound. 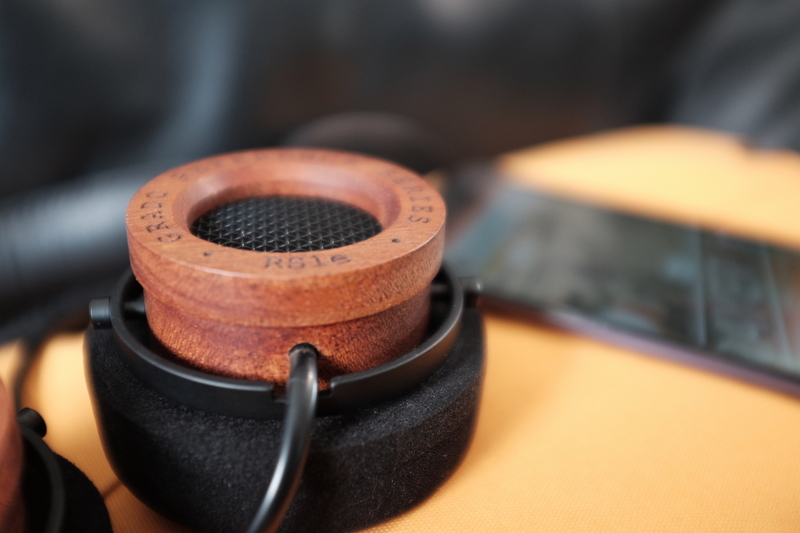 Related: The drivers are huge at 50mm, and they are remarkably balanced, particularly considering that the cans are hand-crafted rather than machine-made. 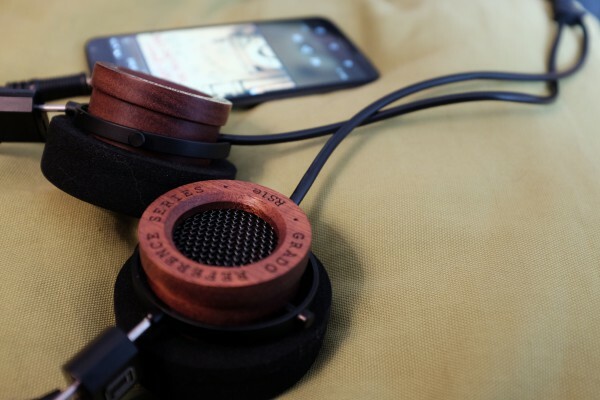 Grado Labs clearly makes the RS1e for audiophiles, by every measure that matters. Even before placing upon the ears, the cans evoke fine-fidelity—from the aforementioned retro, wood-enclosure design to the thick (and heavy) Y headphone cable that measures 67 inches; the kit also comes with a 15-foot extender. RS1e are super light to hold and rest over the head. I wouldn't call them the most comfortable cans for prolonged listening, despite that being the obvious intention. Eardrums won't fatigue, but earlobes might. "Defined" and "spacious" best describes the RS1e sound. Instruments obscured by other headphones are revealed by these cans, which exceptionally expose detail, such as vocal nuances or tap of drum cymbals. Spectacular soundstage, bright highs, and warm mids are defining acoustic characteristics. Lows are present, vital, without being punchy. Bass is fuller above 50 Hz—but be warned: If thump, thump, thumping bass matters most to you, RS1e will disappoint. They're excellence is elsewhere. The open-ear design contributes to airier, more realistic soundstage that is best appreciated when watching movies. For example, listening to two people talking in a restaurant feels live, as the clank of dishes and background chatter are spatially placed around you. Detail heard is almost unsettling for the realism. For music, soundstage and definition are most pronounced on music engineered before the turn of the century. Pop and rock classics from the 1960s, 70s, and 80s or classical music from any era get the biggest bang from the RS1e. But, because of the open-ear design, the cans leak sound, and you will hear ambient background noise, too. These aren’t best for your metro commute or air-flight. But listening quietly, you will hear detail silent to other headphones. Low impedance means the RS1e produce plenty of volume from portable devices like laptops and smartphones, without need of a digital amplifier. I used the cans, with complete satisfaction, connected to an array of portables: Chromebook Pixel LS; iPad Pro; iPhone, 6, 6 Plus, 6s Plus, 7 Plus; MacBook Pro 13-inch; Nexus 6, 6P. The Grados surprise most listening to compressed music like 128kbps AAC or 320kbps MP3. The cans reveal new details, but also imperfections. Streaming 1411kbps FLAC (Free Lossless Audio Codec) from Tidal delights the ears with detail and timbre. Same applies to CD listening. At $695, the Grado RS1e are a pricey purchase best meant for buyers looking to listen to something better than compressed AAC or MP3. The headphones demand better audio source and will delight you if given it. Bass is a deal breaker for those wanting punchy lows. For everyone else, spacious soundstage and refined detail will make other cans listening to compressed music sound muddy. Be warned: The RS1e almost certainly will disappoint out of the box. Expect a flatter sound as the cans break in. Mine started sounding more pleasing after 10 hours use, but 50 hours or more is recommended for full fidelity. When they do fully burn in, wow. Am I sorry to part with the RS1e? Absolutely. I gave them a last listen before sale—and if the buyer hadn't texted he was 30 minutes out from San Diego, I would have cancelled the sale. But that's okay. The cans get another chance to be a beloved birthday present. May he enjoy them more than I did. Soundstage is how instruments are spatially placed in audio recordings. The RS1e present superior soundstage, such that you often can visually place the instruments and singers, and even feel like you are in the room with them. Impedance is a value you need to worry about. We'll skip the science and get to practical matters: If you're buying cans to listen to portable devices, like smartphones or PCs, you want lower impedance; I find 32 ohm—what the RS1e deliver—to be just right. If impedance is too high, you won't jack enough volume to your headphones without aid of an amplifier. For stereo systems you want higher impedance, upwards of 600 ohm. Frequency response typically ranges from 20 to 20,000 Hz, with bass and treble at both ends, respectively. The extremes exceed normal human hearing range, but not necessarily perception: Below 20 Hz, the listener may more feel the bass than hear it. RS1e offer ample range: 12-30,000 Hz. Transducer creates the sound, and there are typically three types: Dynamic (most common); Orthodynamic; and Electrostatic. Think little speakers. See Headfonics' explanation for more. RS1e are dynamic.